Biomedical engineers at Johns Hopkins University in Baltimore developed a process that causes stem cells to transform into two different types of tissue found in the walls of blood vessels. 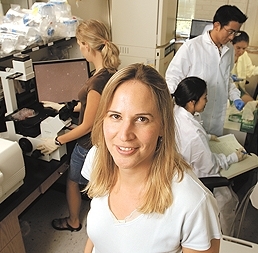 The findings of the team led by chemical and biomolecular engineering professor Sharon Gerecht are published in the January 2013 issue of the journal Cardiovascular Research (paid subscription required), and appeared online earlier. Gerecht (pictured left) and colleagues worked with both human embryonic and induced pluripotent stem cells to find the right conditions for the stem cells to transform into vascular smooth muscle cells found in the walls of blood vessels. Stem cells can transform into specific types of cells needed by particular organs within the body. Induced pluripotent stem cells are adult stem cells, usually taken from skin biopsies, that are genetically reprogrammed to act like embryonic stem cells. The team needed to engineer two kinds of vascular smooth muscle cells: synthetic smooth muscle cells that migrate through the surrounding tissue and repair or help support the newly formed blood vessels, and contractile smooth muscles cells that remain in place and stabilize the growth of new blood vessels to help maintain proper blood pressure. In earlier research, Gerecht’s team produced a type of tissue similar to vascular smooth muscle cells, but they did not have all of the properties to work like natural smooth muscle cells. To get the right characteristics in the vascular smooth muscle cells, the researchers tested various combinations and concentrations of serum and growth factor they added to the cells from the earlier studies. Serum is the liquid portion of blood with the red and white cells removed, while growth factor is made up of proteins on which cells feed. The goal of the research, says Gerecht is “to give doctors a new tool to treat patients who have problems in the pipelines that carry blood through their bodies.” The work of the Johns Hopkins researchers can lead to production of new blood vessel networks, assembled in the lab for transplanting into patients, which could benefit people whose circulatory systems have been compromised by heart disease or diabetes. In addition, small blood vessels are formed to nourish growing cancerous tumors. The new findings could help cancer reearchers better understand how blood vessels are stabilized in tumors, with potential applications in the treatment of cancer.